Busy weekend and quite a bit achieved really. Having got the kitchen cleared from being a warehouse on Friday morning, more stuff arrived - the Valdani shipment - see the new 60wt solid colours on the web and the new lower prices for all the Valdanis. 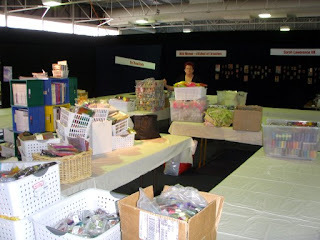 Then an enormous shipment of more sari ribbon, sari twist, silk yarn and more turned up not to mention a few other things so everything was chaos once more but after a weekend of sorting and packaging things are almost back to normal. We have worked right though though apart from an outing to watch the rugby last night where the Wallabies got ever so soundly beaten. It should be a great game in Brisbane. This is my Nana when she was 19 - I have printed out one of the old photos I brought back from NZ onto silk inkjet paper and put it onto a Moonshadow Misted Tissutex background. If you enlarge the pic you will be able to see some Grungeboard and some of the sticky lace tape I have found. We should have that in stock this week. I sprayed it with Moonshadow Mist and whilst one side sticks on, the other side I used onto webbing so you can double dip. Easy to stitch on if you wanted to. 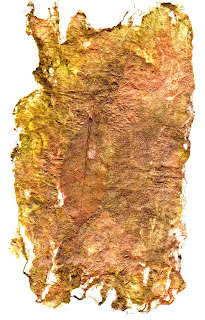 Then I have been making silk paper using cocoon strippings and the fabulous Radiant mists which I am so pleased with. Top one has scrim and a skeleton leaf in it and the bottom one some Grungeboard added. I am still spraying anything which stays still long enough but not the next door neighbour's cat, Mango. She walks in and out at will and makes herself at home while her owner is at work during the day. This morning we went to Soto for breakfast and it was good to get out of the house and walk and relax. Another busy week coming up but at least I have been able to tick a few jobs off my list including my part of the newsletter for tomorrow's posting. 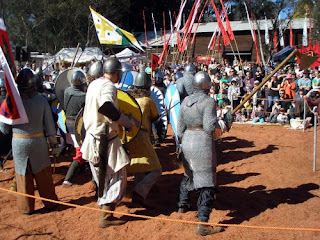 There was a medieval festival on in Balingup while we were there so there were loads of people around. 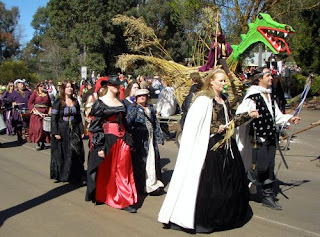 There was a procession through town - here are all the knights - the Saturday was lovely and sunny. Here are the King and Queen - turns out this is the new King and Queen - the other one must have abdicated. This is the 15th year for this festival. 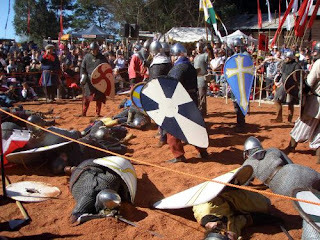 The Normans won as you imagine if you know your history and Harold was shot with an arrow through his eye. It's been pretty bedlam around here too - the kitchen yesterday looked like a warehouse so we simply had to go to Spaghi to eat. The latest CPS has arrived and all gone out to new homes, lots of fibres etc from Jacinta - and I managed to knock at the scrim sitting neatly in colour selection for me to cut and toll in bundles, onto the floor at one stage and I am half way through winding a fabulous new yarn which we have called Yummie - felted wool with a stitch over the top - the embellisher will love it. Hopefully tomorrow we will be back up to date. 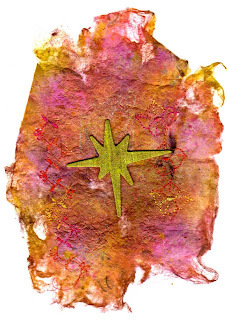 And then I will be off to play - I only had a quick chance to rush into the studio and do some spraying with the new Radiant mists - I am testing them on various fabrics. We had a wonderful weekend in Balingup - instant sleep-in the first morning and we did lots of reading, walking, eating, drinking and relaxing and I also played on my embellisher (yes I took it with me), worked on a number of projects - kits and classes - and finally got all the paper work ready for the inaugural embellisher challenge (more on that in a day or two). 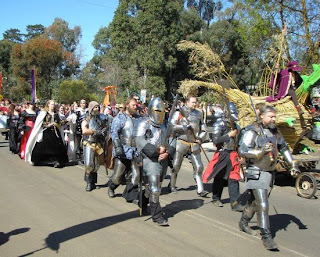 Balingup was very busy over the weekend with a medieval festival and I have some pics coming for that. 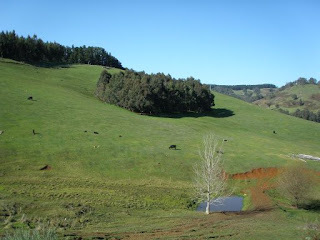 Here is the view from our chalet - lots of cows to wake us in the morning and also loads of little birds so that was like being at home - the birds here are very gentle at this time of the year. This our chalet - Fernridge - there are only two and ours was the top one - really lovely and just what we needed. When you go away from your working environment you have time to think and get stuff done without any interruptions. Working from home like we do, means there is always something which needs to be done. 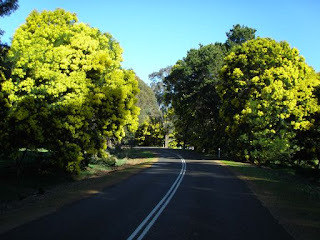 The wattle was all out in its glory. We did a bit of driving and the scenery was glorious. Our car got quite filthy with red dirt have to say. Here I am drinking my coffee - Ian took all the coffee gear with him to make sure we didn't miss out. 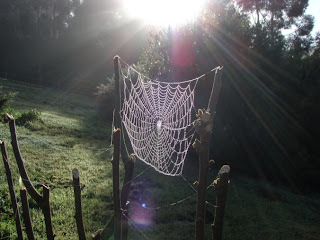 Yesterday morning here were some super spider webs out and about - couldn't resist this one. It was pretty cold in the mornings. Back home we are paying for it of course but our customers are so lovely and they are patient. I am about half caught up with the orders. The Artgirlz charms arrived today so all of those will go out if you have been waiting. There were piles of parcels waiting and stuff due in tomorrow and the next day. 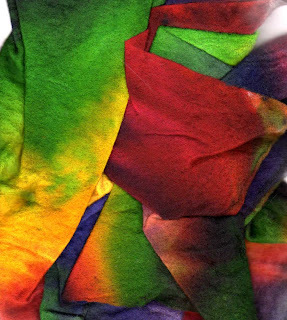 Also got some lovely new yarn which the embellisher will die for... And a huge shipment of Radiant Mists - like Moonshadow Mists but no walnut ink - just loads of rich colour with mica and acrylic. I had to try them out immediately and the first piece of paper I found was the invoice inside the box - it looks spectacular but Ian is not so impressed. I have been looking for sprays with these strong colours and these are better value and colour than any of the others I have tried. So off to play tomorrow at some time - and I managed to watch some of the Lovely Lutradur cd while I was waiting for some printing to happen so it has been all go go go. And talking of Gogo - we are off there tonight with Sarina and Frank as Sarina is over from Cairns for a few days. Today I had to take my eepc into Myer as we can't load pics from the camera directly onto it. 2 hours later I left the pink baby there and finally came home. If I had known nothing much would take that long I would have dropped it and run. What I did discover was that there are very few staff to serve and they now have a requisition book full of doodles mostly coloured in with a bright red pen I found on the counter. Of course I lost the two hours I was planning to play away on my embellisher by standing around in the shop. 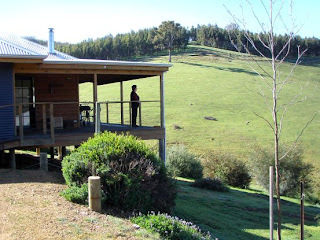 Tomorrow we are off down south to Balingup - about 3 hours south of Perth for a long weekend - this is reward for all the weekends we work doggedly on. We went last year and had a lovely relaxing time - staying in a different place this time - there is a medieval festival on this weekend as well. Tonight we watched Keating the Musical live on ABC2 - enjoyed it as much as when we went to it live here. Paul Keating enjoyed himself as well. 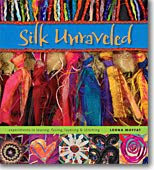 wonderful new book arrived today - Caroline from Rainbow Silks introduced it in her newsletter as something to go with our Opulent threads and she was so correct. There is something a bit special about silk. I hummed and harred about getting this book in but I am glad I did. 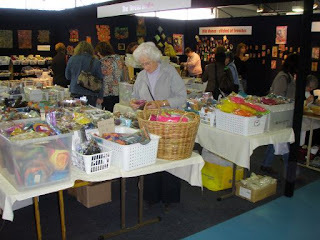 One good thing about doing a show is that you get lots of lovely goodies in again - that is after you have counted and reordered so there are lots of good parcels arriving daily at present. This is an announcement for those customers of ours in Queensland who are always asking when we are coming back to Brisbane. 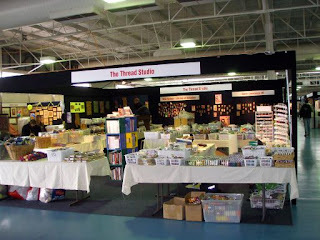 Hold your breath no more - we will be back in May 2009 - 29 - 31 - for the inaugural Textile Art Festival at the Brisbane Exhibition and Convention Centre (long time since we were last there) - this is a conference for everything textile - embroidery, felting, knitting quilting, spinning, weaving, sewing, wearable art, fabric and thread. I thought 'how could we not be there' so I booked a table or three today. 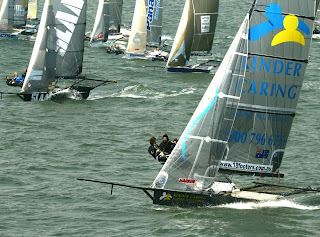 The format will be similar to the AQC in Melbourne in February. A three day conference component with 10 classrooms running concurrent sessions, a workshop programme for daily visitors, inspirational feature displays and retail expo running over the three days. I I believe there will be a dedicated website for the Festival before too long as well. Also the biggest excitement today was that our 330kgs of 18.5 micron Australian Merino wool finally arrived in the country (yes we have to buy it back) so Jacinta is happy and she can get back to dyeing - I think her shed was empty. Our merino wool is so beautiful and great for felting, spinning and using on the embellisher and of course all in such wonderful colours but now we will be able to sell undyed as well. Good day for sport yesterday - The All Blacks had a wonderful win - 19 - 0. 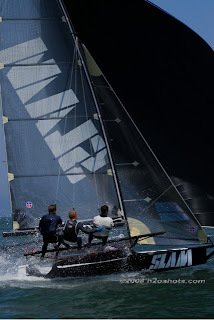 NZ got on the medal table with some super results. 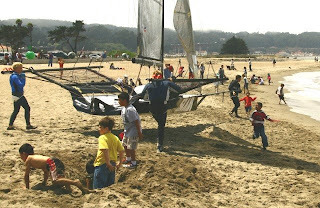 Grant came 3rd in San Francisco. Bruce did a cycle race from Collie to Donnybrook and back to Collie - he would have slept well. 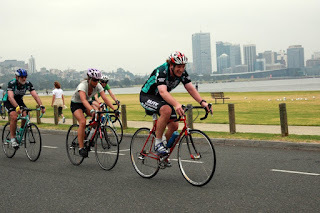 Here he is cycling on South Perth foreshore on another day. I have been having fun creating fabric with the embellisher - layering and texturizing for my online class (and for my class in Geelong). I am back to working with crystal organza with a new eye....... The pics don't do the sample justice - there are 2 layers of organza - lime green and purple with stuff inside. The lime green doesn't show up at all but it is there. The longer you keep playing with this machine, the more your realise you can do. Angelina might be worth a trap as well. Lovely sunny day in Perth - not so in NZ I see - Helen and family have been unable to go where they wanted - loads of snow and roads closed. Life does that. Found Grant and Slam again in the pics department. I think it photographs well. Mandy sent me a page from the Peter Sheppard shoe catalogue. She knows I am a sucker - look at those wonderful new colours in the Arche shoes - my very favourites. Credit card watch out - who can resist those colours? Just as well they haven't a shop in Perth - or rather - what a shame they haven't a shop in Perth. Phone does well though. ABs play South Africa tonight. Fingers crossed for a good game and a good result for you know who. Managed to find SLAM again in San Francisco. 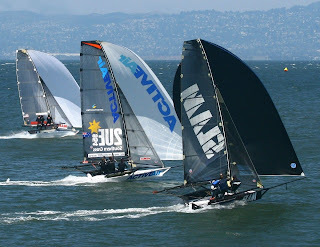 I think they are coming 4th or 5th with 4 more races to go and the Bridge to Bridge to sail. 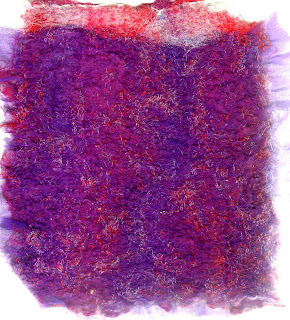 With a fair bit of searching I have found some adhesive paper lace which I have been sticking onto Tissutex and colouring - I can see all sorts of possibilities with this. Show some pics when I have some more respectable samples. Lovely and sunny in Perth so off to wander up the road tonight since it's Friday night. Rather than watch tv which is not very exciting at all at present unless you want to watch soccer or similar. Playing with silk paper and silk yarn knitting for Ratty Tatty Papers - Doreen will recognise these felt flowers - the embellisher likes this silk paper and silk yarn and it especially likes these cheap flowers. 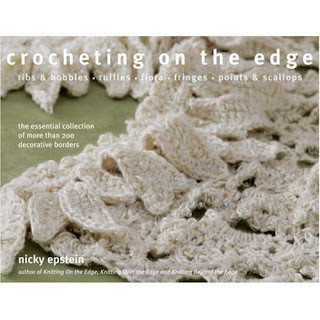 Today I got a lovely new Nicky Epstein book Crocheting on the Edge - haven't crocheted for years (made the compulsory bedspreads with crochet squares and ponchos and stuff) but looks like a new start to add to my little knitting adventures. I can see all manner of little dangleys appearing using embroidery yarn and the like. And I also got some advance new rubbing plates to play with and assess for buying - one with lace and words and botanical sort of things - I did a pile of rubbings on tissutex with shiva stiks then I will spray with colorwash for tomorrow - I think they have potential. Also got a pack of permanent markers for using on acetate and pewter charms and the like. So once I have finished cleaning up from the show - trying to clean my workshop stuff but I can't find the plug for the sink in the studio - did Sarah take it home with her I wonder? - then I will be able to clear a better space to work in. Do go to our website and see the wonderful work done by some of the participants in the first Embellish Stitch Enrich wokshop. Ian has set up a gallery. Still pottering along slowly and quietly - the rain has gone and the days are nice and sunny. We got woken in the middle of the night with car alarms (not ours) and people yelling and stuff so tha was the excuse to sleep in and go for a leisurely breakfast at Sotos. Ian got a load of dirt for one of the gardens out the back so it looks like we will soon have a new section to admire - this weather means we are a bit negligent in the garden. Yesterday we got new shelves for the lockup so that is still messy but means more storage space for threads etc - all the Valdani threads will have a home now. Last night since there was no rugby to watch we sat and very much enjoyed the replay of the ABs vs Wallabies game last Saturday - very enjoyable. When Helen was here she gave us a book (she said she knew I love books- how could anyone know this???) 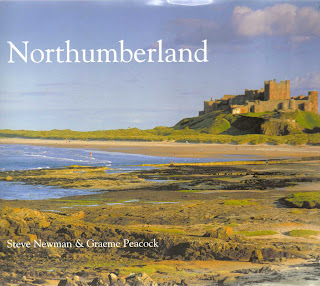 of Northumberland where they live. It looks fabulous and another place we should be visiting. Thanks Helen - hope you are having a great remainder of trip. A few people have asked what a flimsie is? 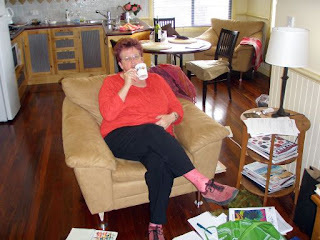 I have shown them before on my blog but they are a very fine merino batt which Jacinta dyes for us. This is my Indian Splendour one - the other was I was embellishing on was Kimberley Dreaming. We are low on stock after the show but Jacinta has sent a few more and more to come - this one was in the parcel this week so I grabbed it to play with. 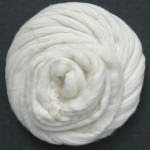 It is lovely to use as a base - it is a pre felt but I like to use it with srims and chiffon and all that stuff - very soft to use. Now we are off to Fremantle for a drive to finish off a relatively relaxed weekend - although I have been still counting and sorting and ordering - nearly up to date. 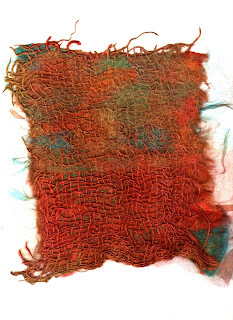 I have also managed to get into the studio to play with silk fibres and get working on my new book which is all on papers of various sorts. 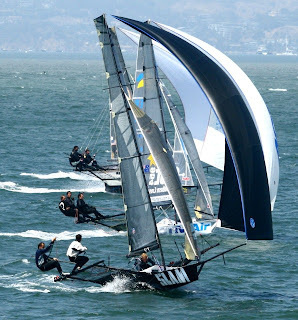 Grant has just phoned from Heathrow - he is just off to San Francisco to sail in the 18ft Skiffs and being a mother I can also say congratulations to Bruce for finishing his Masters in Applied Linguistics. All that work always pays off!! Everything is nearly back in order but people keep getting in on the pretext of needing one particular thing and then proceeding to 'shop' - that kinda holds up my progress. But as always with a big show, you get everything done in the end. I forgot to take pics of Helen or her stand - very remiss of me - but today she sent me this pic from the airport just before they flew off to Uluru. This is a dodger photo - dodgers will know! 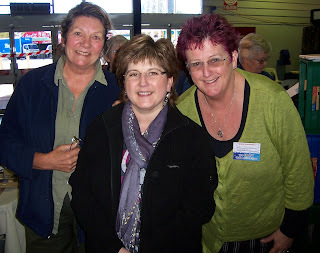 Pam (who I haven't seen for ages and didn't get to talk to), Helen and me. Helen's display of work was lovely to see in the flesh - I think everyone enjoyed seeing her work. I hope you have a great time in NZ, Helen! I snuck up to the studio for a little play this afternoon after packaging all the Quilting Arts - yes they finally arrived only 2 weeks late. If the printer could learn to get his act together....... I also noticed that along with all the other errors on the invoice he has written UK customs. No wonder Aust customs stop the shipment. 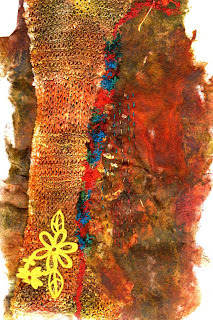 This is an embellisher fabric - using a sandwich of cotton scrim, flimsie, chiffon and jute scrim. If you look carefully you will see what happens when you work from the back extensively as well. I have only done this to half. I like it better where it hasn't been worked as it allows more definition of the scrim but on the other hand it makes for depth. My next class starts next Tuesday and they are all pretty chatty and enthusiastic. The embellisher is great for blending. Val and Jim are back from their long trip o/s so we are off to dinner to catch up with them. Here we are back in action. 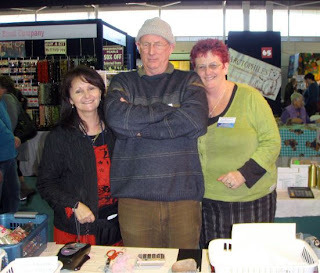 The Perth show was wonderful - so nice to catch up with so many people - the workshops were good - thanks to those who came - hope you enjoyed yourselves. Helen and Sarah were super guests to have and I am sure everyone enjoyed seeing them at work. If you missed out on Sarah's book, there are more on their way and if you check our website you will see I will send you an extra gift if you order a copy before the 15th. Also lots more Artgirlz charms are already winding their way to Perth. Here we are arriving to set up last Thursday - doing a show at home seems to involve more work than when you go away - this is because you have to do everything on the one day. When you go away, you spend time packing many boxes a week or so beforehand and once the palettes have gone you only have to fill the suitcases - here it means filling a van twice. Nothing like looking at an enormous space and making decisions. Plus it rained very hard all day especially every time we were carrying things, Have you tried balancing an umbrella and a giant heavy box? 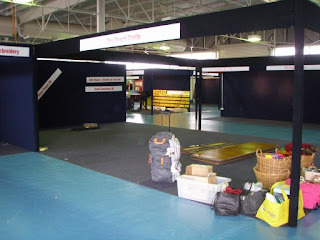 So here is Ian - tables all out, cloths on book boxes all set but loads to do. Where to put stuff? Here I am with the same dilemma - not much further on. Lots of work later - we were finished by 8pm and off for a meal and into bed for an early rise. If only Mareene would start the show at 10am. Still abandoned. Thanks Jas - you did a wonderful job. At the end of Sunday with the help of Kazuko and Bruce (whatever will we do next year when they are not here...) we were packed and gone by 10 past 6 - and then unpacked back here by 7.15pm so we all went out to dinner and Ian and I slept like logs, leaving the answer phone on until Monday morning. After two days everything is almost back to 'normal' but of course stock to count and orders to do - loads more flimsies arrived on Monday - that is Murphy's Law. However, I may even get to play on my embellisher tomorrow. 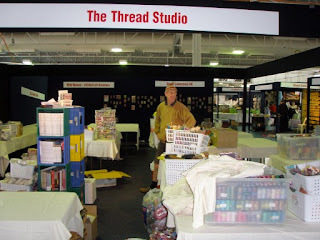 Busting to get into the studio and not just to clean and tidy stuff after the workshops. How could I have doubted them? Back in all their glory. We were working when the game was on but Bruce videod it, Jonathan played bluff (he is an Aussie supporter) and they won!!! Here is Jimmy Cowan - I reckon he is worth his weight in gold. 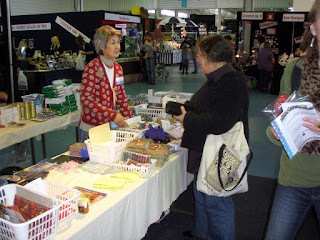 I have been AWOL I know but we have been flat out getting ready for the Perth show, it took all of Thursday to pack the van in pouring rain, do two trips to the showgrounds, unpack the van in pouring rain and then work Friday and Saturday so far. One more day and pack up and everything home to unpack, sort, etc etc. 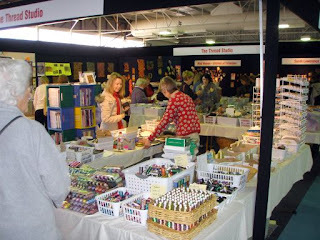 It is a fabulous show so far and the participants in my hands on - Ratty Tatty Papers, have all been wonderful. 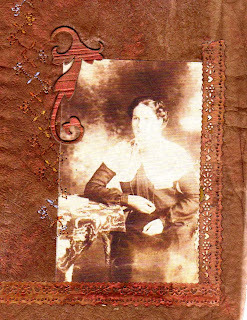 I am starting an online workshop in Jan - Ratty Tatty Papers - so this was a good little taster. I have taken photos but Ian is sound asleep on the sofa with a smile on his face after the AB win so I will be back on Monday to show you a bit of the show. In the meantime, Helen Cowans, one of our two guests, is running a workshop on making her fabulous towers - on Tuesday and Wednesday this week for any Perth people who would like to join in. The Wild Women challenge was wonderful and I will have pics and also the Art to Wear has been to die for - some fabulous work from students in the Perth area.